Blue Christmas services honor the dark, depressing side of the season. 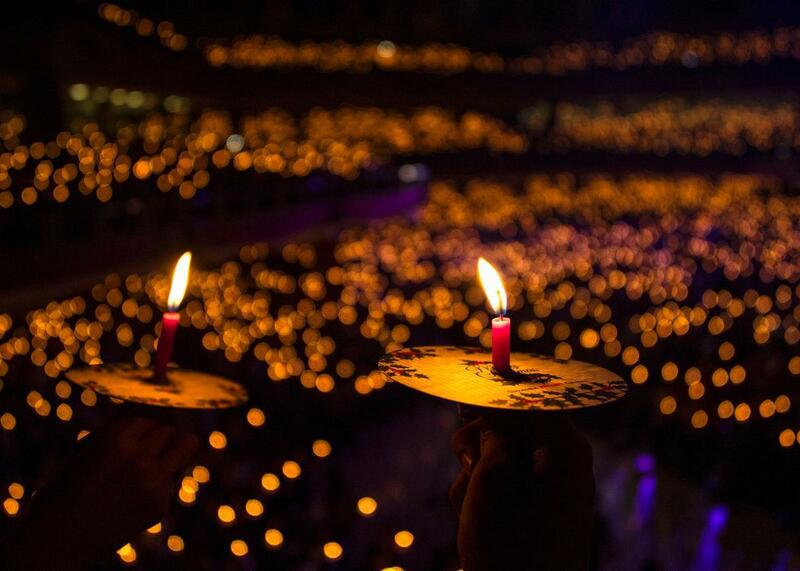 Christian faithfuls hold candles as they attend a mass service on Christmas eve in Surabaya on December 24, 2015. December 2016 poses a unique challenge: How are we supposed to celebrate “the most wonderful time of the year” when the year itself has been godawful? The halls may be decked, the cookies baked, Mariah Carey’s Christmas album cranked to 11, but it feels impossible this year to fully tune out the crumbling world outside. For many of us, the season feels like nothing more than the welcome end to a sad and scary slog. It was moods like this that “Blue Christmas” church services were made for. There are always people who react to the season’s forced festivity with gloom, after all. The holidays shout-sing “DING DONG MERRILY ON HIGH!” in your face even if you’re dealing with grief, depression, job loss, or divorce. In response to this dissonance, increasing numbers of churches now hold special evening services that recognize loss, fear, and sadness. It’s a relatively new tradition that deserves to be celebrated more widely. The idea of Blue Christmas is to acknowledge the darkness, and let it be dark. That is a quietly revolutionary act in an optimism-obsessed culture that would pressure even the Little Match Girl to look on the bright side. Some churches refer to the event as the “Longest Night,” because many services take place on December 21, the winter solstice, when the sun stays hidden longer than it does on any other night of the year. The structure varies widely, but common motifs include candles, music in minor keys, periods of silence, and time to privately share specific sadnesses and fears (say, by writing them down and placing them on a “tree.”). It’s hard to measure to spread of Blue Christmas, but everyone seems to agree that the concept is becoming more popular. As for an origin story, some accounts trace it back to British Columbia in the late 1980s; Taylor Burton-Edwards, director of worship resources for the United Methodist Church, believes it originated in the hospice community, and then migrated to churches in the 1990s. Regardless, by the late 1990s the practice had become widespread enough that many denominational offices were providing resources to individual congregations to hold the services. They seem to be most popular in mainline Protestant and Episcopal churches, but you’ll find them elsewhere, too. The practice can even be adapted by non-Christians, especially when it’s framed as Longest Night. Many world religions have winter holidays that can be turned “blue.” Even for non-believers, some kind of counter-programming makes sense as a response to the crazed Santa-fication of American culture this time of the year. Because the format is so flexible, a Blue Christmas service in a blue district could directly address feelings of dread in the wake of, say, a presidential election. “It has to be embodied in the way the service is put together, so there’s actual time given for disillusionment, anxiety, fear about the future of life as you have known it, and even to name the political issue for those who are anxious about that,” Burton-Edwards recommends. “Frankly I think this year, that would be the case no matter who won the election, because that’s how polarized we have become.” He emphasizes that church is not group therapy, but added that in its proper spirit, a Blue Christmas service is an offering of solidarity, no matter the cause of the pain. It’s a small offering, to be sure. One religious ceremony will not fix our problems, personal or national. There’s a good chance it won’t even make us feel better. But when darkness falls and feels like it will never lift, it’s worth gathering together for an hour or so around the light.